Looking for an Oliver Bonas student discount? 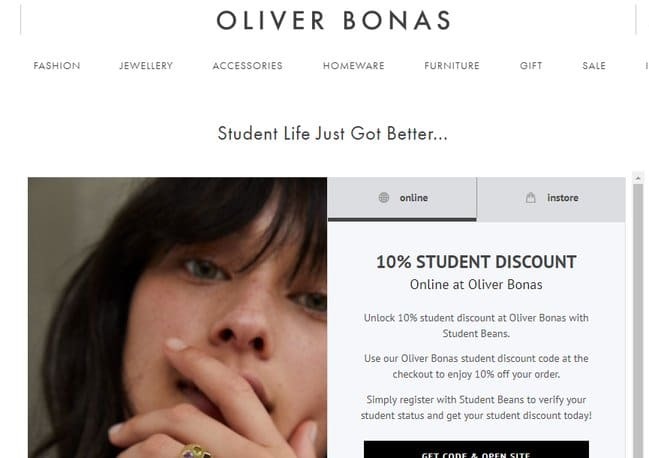 We can confirm that you can get the Oliver Bonas student code to get 10% off full priced items at oliverbonas.com by heading to this special page, verifying your student id (NUS accepted) and you’ll be issued with a promo code. 10% Off Oliver Bonas Student Discount Code! Did that help keep some of that student loan in your pocket? We sure hope so! But the savings don’t stop there. The Squirrel has been doing some research into the best ways that students can save and do you know what, we’re going to show you how. That’s right, we’ve constructed this exhaustive guide so you can get some nice discounts when you’re buying that fabulous dress or sparkly jewellery. Our clever contents box below means you can go straight to any of the relevant sections by just clicking on it! Is there a Oliver Bonas NUS Student Discount? We can confirm that there is an Oliver Bonas student discount for 2019. The standard reduction is 10% and you get it by validating your student status either in-store or online. Go to this page on oliverbonas.com. Validate your student status. NUS is acceptable as are other valid proof. You’ll then be issued with a Oliver Bonas student discount code. Enter this code at the check-out. Get a juicy 10% off! It does state on the ts and cs that this is for full priced items only. Don’t worry though, if you’re buying something in the sale you’ll be getting a fantastic bargain on a beautifully crafted item. Students will then be issued with a student discount code to get the 10% discount at the online checkout. Did you bag a bargain? We certainly hope you did. Keep reading on though for some more amazing saving advice. 2. Is there a Oliver Bonas NUS Totum or Unidays discount? We often get asked if there is a specific Oliver Bonas Unidays discount or one for NUS Extra. Therefore, we’ve created this section to answer them and help students save! There is currently no Oliver Bonas Unidays discount. There is a student discount but it is through Student Beans. To get it go to this page on the website and follow the instructions. You’ll then be issued with a unique promo code to use at the online check-out. Also don’t forget to check out our student savings section at the top of the page for even more ways to save. All NUS students qualify for a 10% discount, but this is through a Student Beans code. Just have a look above to see how you get it. If you are in store then your NUS or NUS Totum card should be presented to get 10% off. However, just to confirm there is no NUS code from the nus.org website. We hope that cleared it up for you! As well as there being a student discount, there are some Oliver Bonas promo codes and Oliver Bonas vouchers that are released throughout the year. We list any current ones the savings section at the top of the page. So we hope you’re making some fantastic savings on your purchase at Oliver Bonas but to make things super simple we’ve put together a savings step by step checklist to make sure you make the biggest savings. Make sure you get the 10% student discount for online purchases. Get it here. Check the offers page to see if you can get bigger discounts. See if a big sale is coming in our sales diary below and save even more. Free delivery for all orders over £50. 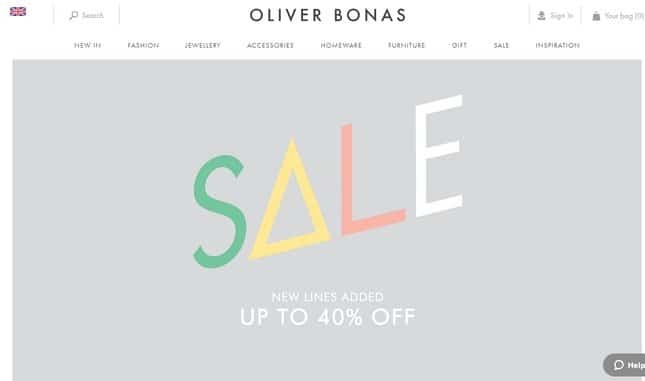 To get the biggest student discounts for Oliver Bonas then the big sales are the time to do it. We know that this isn’t always practical but check out the diary below to see if one is coming up. Then if you hold on the discounts could be HUGE! The brand partakes in the Black Friday. Last year there was a 30% discount code which worked on a large range of items. It only ran for four days so students had to be quick to get in there. Oliver Bonas’ big sale started on Christmas Day with 50% off a great range of fashion, jewellery and homeware. This is consistently a great time to grab the bargains. Unfortunately the student discount doesn’t work on sale items, but that is only 10% any way! Don’t forget that promotions run throughout the year that you can make great savings at. Check out the savings section for the latest. We’ve noticed that around the middle of April there is a good mid-season sale at OB with up to 50% lots of lines including clothing, jewellery and gifts. So mid October is a classic sale period called the Autumn mid-season and Oliver Bonas is no different. We’ve seen some fab reductions of up to 70% off in the past. A small and quirky household brand that also stocks clothing and gifts, it may surprise you to hear that the founder’s name isn’t Oliver Bonas… but rather Oliver Tress. Originally a single boutique that has since grown to several physical shops and a large online presence, Oliver Bonas is fast becoming a firm favourite amongst style conscious Brits who want to stand out from the crowd and not be caught wearing, sporting or having the same aesthetics as everyone else. Those residing in London may already be familiar with the brand, but for those outside of the capital, a little less so. Now with a range that features women clothing and accessories, homeware, furniture and gifts, there’s truly something for everyone – and this is absolutely isn’t a brand just for females. The Oliver Bonas fashion range is ready-to-wear and in a variety of neutral and pastel shades and colours for an understated but classic look. The jewellery is contemporary and modern, setting off their outfit pieces stylishly and giving a touch of glitz. The accessory range is extremely Instagram-friendly, with everything from bags and purses to scarves, hats and make-up bags included. If you’re not into dressing in a feminine style, the homeware and furniture may still appeal. Key classic pieces, many of them handmade make for perfect student room furniture – as you only need one item to really stand out and finish off a room in a way that’s modern, cosy and appealing. The gift range is full of quirky and beautifully designed items as well as gift cards and vouchers. You can safely purchase something from Oliver Bonas as a gift for any occasion and rest assured that no one else will have bought the same. The exclusivity of Oliver Bonas makes it a great place to buy from if you like to stand out from the crowd. It’s the kind of store you sometimes find in upmarket seaside towns – full of interesting and quirky nick-nacks that you just don’t find anywhere else. The brand is definitely high-end but not luxury; so not completely unobtainable to students. There’s also often clearance and sale items available online, so be sure to check back if at first you don’t find a price you’re comfortable with. Thankfully, as a brand that values it customers and staff (they chose to pay their workforce the living wage as soon as they could), they understand that not everyone has lots of spare cash to splash, and so do offer a student discount. This is valid both in-store and online and either way, buying from here will soon land you with beautiful purchases that are of great craftmanship, fantastic quality and Instagram-worthy aesthetics! Of course, here at Student Discount Squirrel, we’re advocates of you carrying your student card with you at all times in case of discounts and promotional offers from retailers, restaurants and clubs. But how often do you actually remember to take it out? Likely not enough! This card holder is cute and delicate, so perfect for your student ID card and other essential cards. Two card slots allow for plenty of room and make a great addition to any purse or wallet. Perfect to cover up the sometimes-unpleasant scents that can linger in student digs when you least want them to, this reed diffuser will fast spread a new and festive fragrance around your room and dissipate nasty odours. The essential oils used are hand-blended and will soak gradually up the rattan reeds to fragrance your room. When you can’t smell it anymore, just flip them; and the process will begin again! It also makes for a great gift if you’re stuck for ideas. OK, so you’re a skint student; but that doesn’t mean you can’t have wanderlust and travel just like anyone else! Smart shopping and booking will help you visit new places, but first, you’ll need some inspiration. This great guide gives you the lowdown on shopping, eating, drinking, culture, sightseeing and accommodation across the continent in a way that’s witty and fun without being boring or patronising. You’ll soon be full of ideas to take away and globe trot with! Oliver Bonas began as a small business as enterprising Oliver Tress started imported goods back from Hong Kong, where his parents lived, back to the UK, for his family and friends. Recognising a gap in the market for quirky and unusual gifts and homeware, he graduated university and started importing properly. Saving all the cash he made, he saved up for his first retail space in Fulham, which he hand-painted along with his uni roommates and invested £60 in a second-hand till. The store brought in a couple of hundred pounds every day but soon grew to attract lots of locals and Oliver could expand. We get asked tons on student discounts for oliverbonas.com, so we’ve put together a handy table below to answer all your questions. We hoped our humble Oliver Bonas student discount guide has helped you save some money – it should have done! If you like Oliver Bonas check out these stores. Oliver Bonas Fun Facts – Did You Know? The store was founded by Olly! Who is said to have an exploratory spirit and love of design from an early age! Go Olly! Olly bought back gifts for friends from travels before launching a small business in 1993. The company says it is influenced by the “alchemy of great design and fresh thinking”. Today Oliver Bonas has 70 stores across the UK. The company moto is: Work Hard, Play Hard & Be Kind – which we love!